Thirty Seconds to Mars (commonly stylized as 30 Seconds to Mars) is an American rock band from Los Angeles, California, formed in 1998. 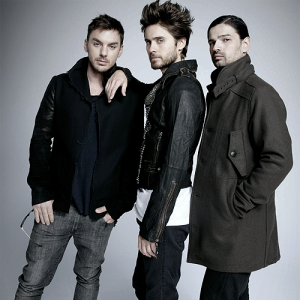 The band consists of Jared Leto (lead vocals, guitar, bass, keyboards), Shannon Leto (drums, percussion) and Tomo Miličević (lead guitar, bass, violin, keyboards, other instruments). The band's debut album, 30 Seconds to Mars (2002), was produced by Bob Ezrin and released to positive reviews but only to limited commercial success. The band achieved worldwide fame with the release of their second album A Beautiful Lie (2005), which received multiple certifications all over the world, including platinum in the United States. Their next release, This Is War (2009), showed a dramatic evolution in the band's musical style, as they incorporated experimental music as well as eclectic influences. The recording process of the album was marked by a legal dispute with record label EMI that eventually became the subject of the documentary film Artifact (2012). Thirty Seconds to Mars then moved to Universal Music and released the fourth album, Love, Lust, Faith and Dreams (2013), to critical and commercial success. As of September 2014, the band has sold over 15 million albums worldwide. Thirty Seconds to Mars has consistently enjoyed sold out tours and numerous headlining festival slots. The band is noted for its energetic live performances and for fusing many music genres. They have been compared to the sounds of bands such as Pink Floyd, The Cure, Tool, and U2, for their philosophical and spiritual lyrics, concept albums and their use of experimental music. Thirty Seconds to Mars has received several awards and accolades throughout their career, including a Guinness World Record, and has been included in the Kerrang! list of best artists of the 2000s.